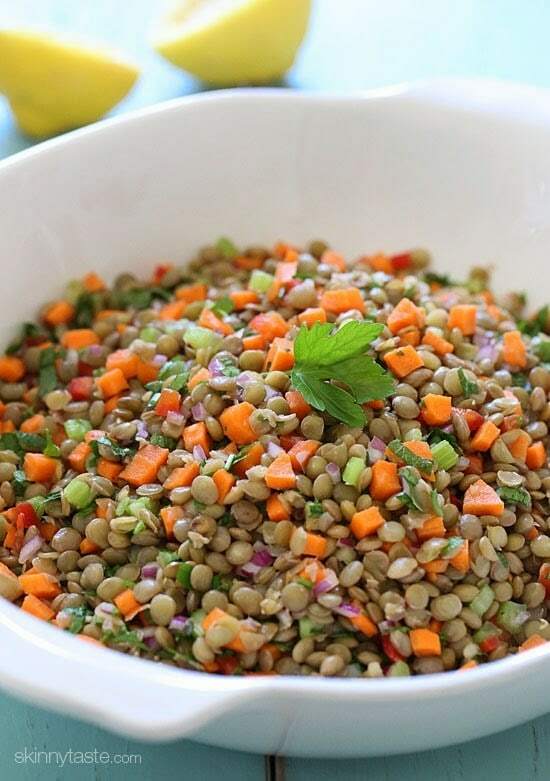 This healthy salad is made with cooked lentils and diced fresh diced carrots, celery, bell pepper, onion, parsley and lemon juice – perfect to make ahead for lunch for the week as the flavors only get better overnight. It’s also vegan, high in fiber, protein and only about 100 calories per serving. I’ve LOVE making my chicken and lentil soup, but I was never really a fan of using lentils in a salad (I’m a picky legume eater). 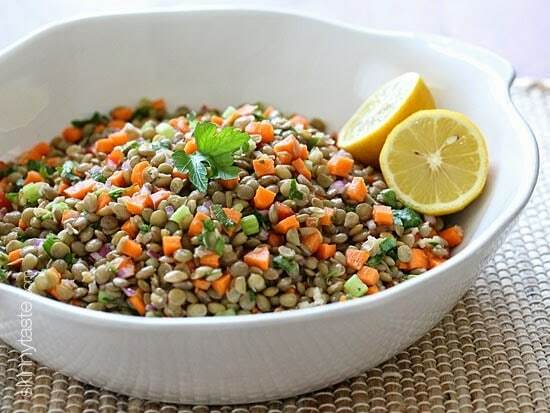 But the other day I bought a small lentil salad at my local health food store to try and take to the beach and really enjoyed it, but I paid twelve dollars a pound for it (for a small container). For that price I’ll make it myself for a fraction of what I paid, plus this makes a lot so you’ll get a few meals out of it. If you’re not a fan of lentils, you can use any legume such as white beans, chick peas or a mix. 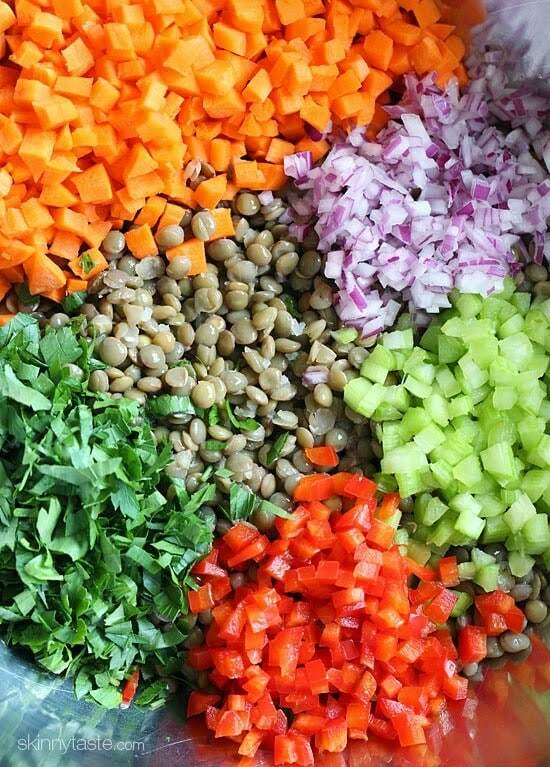 This healthy salad is made with cooked lentils and diced fresh diced carrots, celery, bell pepper, onion, parsley and lemon juice – perfect to make ahead for lunch for the week as the flavors only get better overnight. This is my go-to website when I need recipe ideas. Searched “lentils” and came up with this gem. Super yummy! This will definitely do in my keeper file! Perfect! This was my first time cooking lentils. I served this cold and have leftovers for snacks. Followed the recipe exactly and it’s delicious. I LOVE this recipe. It is so good. I make a whole pound of lentils and adjust the amounts of the other ingredients so that I have leftovers or to take to work for potlucks. I have also tried adding curry powder and balsamic vinegar which was delicious. You basically can add whatever veggies you want and it will be good. I have also mixed it with brown rice which was also good. You have to try it. Thank you, Gina….I love your recipes! I made this and wasn’t wild about it. I undercooked the lentils by a minute or two so it was my own fault. Will try again and cook them a little longer. Very good salad. I sautee the onions with the garlic in the olive oil ( medium heat only) and added the zest of 1/2 lemon as well as the juice recommended . Is there a way to adopt this to the Instant pot? So delish!! Resfreshing, hearty yet light. Keeping this on repeat. I loved this recipe. I used ready made lentils which made it quick and easy to make. I added chopped spinach because I did not have parsley. The lemon dressing makes it light and bright. Definitely will make again. Made this exactly according to the recipe. YUMMMMMY! Great for lunch or anytime actually. A keeper recipe for me. Thank you! Super simple to make and so filling, this salad makes a great work lunch with a piece of chicken on the side. Definitely a winner! Would you pair this with an Indian dish of tikka masala? This was simple and delicious. I added a little goat cheese on top. Yum. Thanks for another great recipe! I love Skinnytatse. This site and the accompanying cookbooks have helped me to lose almost 31 lbs since January 2 (I still have a ways to go)! I made this salad a couple of weeks ago and there was something about the lemon flavor I didn’t love (and I LOVE lemons)! I read through the comments and used balsamic vinegar and now love this recipe and plan to make it again and again! Great job Arielle!! Way to go! Yummmmm! Why did I wait so long to make this? Loved it. My 9 yr old son asked if he could take leftovers for lunch next day. Thank you so much for this recipe! 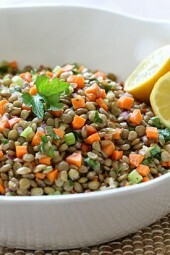 I just prepared/tasted my first lentil salad ever, and it’s delicious! two co-workers ask me what I was eating and wanted a copy of the recipe. 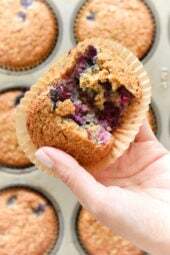 And you’re right… let those flavors meld over a couple of days and it’s even more yummy! Why does my “click to print” button never work? Printer hooked up fine….do I have to be a member to site or something? So many great recipes on here! Not sure? You don’t have to be a member. I just made this today and LOVE it! I love the freshness and lightness, but also feeling satisfied after eating it. And, the lemon juice gives it a great bright spot. So great!!! I have no doubt the flavors are awesome b/c what does Gina do that isn’t good?! 😉 But i need to know how long does this salad stay good for? I’m looking for healthy portable lunches to pack ahead on a camping trip. Thanks! I made this yesterday and even though I complained a bit about chopping all those veggies up really tiny, I loved it! I brought a small bowl for lunch today and gobbled it up. I was a bit hesitant about the Bay leaf but it actually gave it a nice subtle flavor along with the extra lemon juice I added. Tonight will be the big test when the hubby eats it with the Salmon we’re having for dinner. Thanks for the recipe!! Go to Bed Bath & Beyond and buy a Vidalia Chop Wizard. Perfect for chopping small vegetables. I even use it to chopped pickles for chicken salad..
could this be done with my instapot? I haven’t cooked with lentils. Do I need to soak them first? This is quite possibly the most delicious thing I’ve ever tasted! I added some poached chicken season with salt, pepper, and thyme to make it a bit more filling for a quick meal before baseball. I make this often and since there is only me in my household, it lasts a long time! I too add the cumin and extra garlic, vegetable broth: sometimes leave out the oil entirely. I take it to work for lunch and vary what I add to it: tomatoes, spinach, feta, mushrooms, avocado… This is surely a "go to" all summer. Made a hurry-up single serving version by using 1 cup Trader Joe's presteamed lentils & "Healthy 8" chopped veggies (found in the produce section), so all the prep work needed was to chop the parsley & crush the garlic clove. Threw everything in a tupperware with the lemon juice, oil, S&P, shook it up, and placed in the fridge last night. Eating it at work right now on my lunch break, tastes great! I've been cooking with you for years and this is absolutely one of my favorites. This is the second time I've made it and it's delicious! Almost like this more than pizza! Thank you so much! That makes me so happy when I hear that people are truly enjoying my recipes. I had for lunch and delicious. I happened to have all of these ingredients on hand… Wow is this good! I feel good eating it and will be excited to have it in my lunch this week. I made this today (the exact recipe- no substitutions ). It tastes amazing. All the different flavors on one spoon seem to burst in your mouth like a rainbow you can taste. 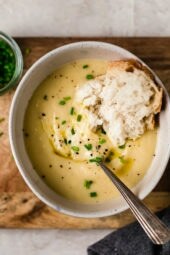 I'd been searching for lunch options that included lots of vegetables and I'm so glad I ran across this recipe. Thanks Gina for yet another perfect recipe! Cooked the lentils with vegetable broth intead of water for more flavor. This was delicious! I can't wait to top it with grilled chicken. For someone that is sensitive to acidy fruits do you have suggested alternative to the lemon? Another great recipe Gina! I made a few substitutions and it was still great. I substituted red onions with green scallions and parsley with cilantro. I only sauteed 1/2 the peppers and reserved the other 1/2 to add once dish was cool for extra crunchiness. I also reserved 1/2 the lemon juice to make a lemon vinaigrette which I added to cooled salad along with reserved peppers, extra cilantro, extra scallions and a dash of cumin….delicious and packed with nutrition! I made this yesterday and have it for lunch today! It is so simple and good! I followed one of the suggestions and added cumin because I love it. I eat lentils a lot over the winter but now I have a perfect summer recipe! Thank you. This is great, now I can make my own for around 1/10th the price! I was previously buying the pre made from the supermarket which ends up quite costly. I love the idea of adding feta too. I will probably serve with some rustic thin toasted bread, can't wait! Sooo tasty. Served this as a side with SkinnyTaste Healthy Baked Chicken Nuggets for dinner tonight. I honestly thought, my husband would not eat it, but he actually liked it. Already excited about the leftovers for lunch tomorrow. This turned out really tasty! The lemon was more sweet than acidic, which I didn't expect. On a whim, I added chopped, dried cranberries to this salad, which I really thought tasted good. My bag of small green lentils from Trader Joe's says that it is 170 calories for 1/4 cup dry. This would be 680 calories for just the lentils in the recipe. Did I buy the wrong type for this recipe? I cannot wait to try this so I hope I didn't mess up!! Sometimes, I cheat and buy frozen, diced carrots. It took me awhile to find them, but Alexia brand sells them. Good luck! Use the Vidalia Chop Wizard. Can be brought at Bed Bath & Beyond usually for $19.95. i wasn't even going to fool around and DOUBLED the recipe! lol! i knew it was going to be a good one. these are the kinds of salad i pay big money for from a whole food deli as a treat. yeah for the recipe! the only change i made was a full head of roasted garlic. this is a perfect salad for a hot summer day! i made mine early this morning and now i'm enjoying it at lunch as i type this. 🙂 yum! thanks for the recipe! pinned it, going to twitter it. Loved this- just like all your recipes!! Thank you!! I used 1 tsp regular salt and it was WAYYYY too salty. Otherwise it would be a really good salad. I'll make it agian with half the salt. How do you dice the veggies so small? Food processor? Thanks! Made this tonight for a side dish and it was awesome! My two-year old loved it! I added cumin to the dressing, and used tarragon vinegar instead of lemons (still used 5 TB). I was delicious, and a great low-point dish. Can't wait to have leftovers. Is this by chance the salad at Whole Foods? I love that salad and have tried to replicate it myself. Thanks for the recipe! No, I don't live near whole foods. I only have a can of lentils, do you think that would make it too mushy? I think it would be great with wild rice, too. It's also a high protein grain. This came right on time since I started slow carb eating. I was getting tired of plain lentils. Thank you! P.S. I TOTALLY get the cost factor. I bought a small legume salad for $6 and I'm pretty sure it was maybe a little more than a quarter of a pound. And they are so inexpensive to make yourself! Can I use red lentils instead of brown ? Just made this up for lunches for tomorrow and I really like this recipe. I had a few small changes; green lentils instead of brown, and added a half tsp of ground cumin. Nice zesty dressing. This would work great with green or black lentils too, red would be too mushy. I think this would also be lovely topped with some fresh soft goat cheese! Yum this looks like a recipe we made in cooking class! My mouth is watering just thinking about it! Yum! 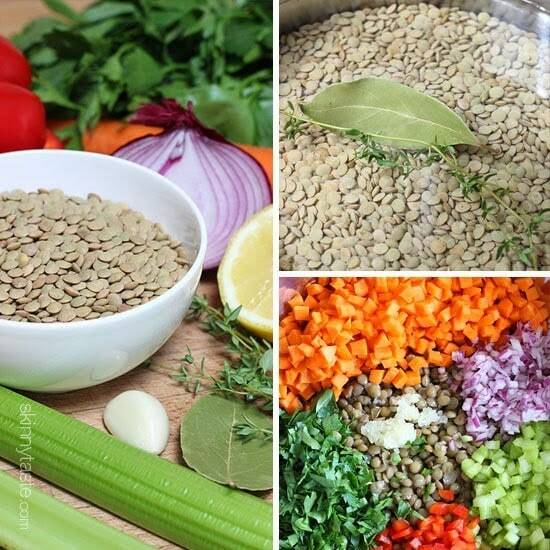 Lentils are one of my favorite vegetarian protein sources, and I'm always looking for new ways to cook them. Thanks for the recipe! I have only cooked lentils once and was left unsure as to if I had overcooked them. This recipe looks so fresh, tasty and healthy that I just might have to try again. And this would easily accommodate whatever veggies I happen to have on hand! Yes, you can really add whatever you like! I wonder if this would work as well with green lentils? I bought them about a year ago, and never used them. Gina, do you have any thoughts? I have made this using both lentil and quinoa….very good!! This looks similar to the yummy salad at Costco. Instead of lentils, it is quinoa with some cilantro as well. 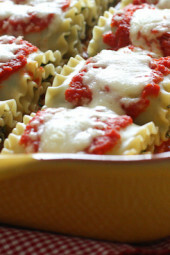 I've been meaning to recreate the yummy goodness and this looks like a great starting point! Thanks again! Quinoa would be great in place of lentils for a quinoa salad! Hmmmm…I have some of that. Maybe I will give it a shot. Sure, you can add any fresh herb like chives or whatever you like!